When Miss Catherine Kent's fiance Richard Montague disappears, she is distraught. Catherine sends for her beloved spinster aunt, Miss Dido Kent. But on the very day of Dido's arrival, a sinister discovery casts unwelcome suspicion on Richard's sudden absence. Long-hidden family secrets begin to emerge as Dido attempts to unravel the strange happenings. Dido uses her logical thinking to carve a swathe through the ulterior motives of the other guests. When she finally arrives at the startling truth, it is to change the lives of those involved forever. But will it be for better or worse, for richer or poorer, in sickness or in health? 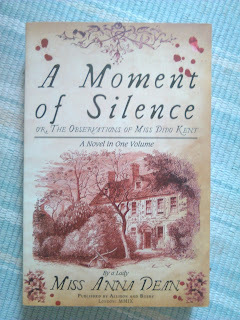 A Moment of Silence is a murder mystery in the vein of a Jane Austen novel, following Miss Dido Kent , a ‘spinster’ detective. In this novel, Dean answers the question of what would happen if Jane Austen had turned her hand to solving murders instead of writing novels. It turns out, that if she had been anything like Dido Kent, she would have been quite good at it. I feel that it’s a safe bet to make that Dido, a remarkably clever ‘spinster’, the daughter of a clergyman, at her brothers’ beck and call due to her financial dependence on them, is a profile of Austen as we have come to know her. The book has everything we have come to love about Austen’s novels, plus a murder mystery. It reminded me more of Miss Marple/Poirot murder mysteries than their modern equivalent, rich people with titles in old houses murdering each other. That being said, like Marple and Poirot, I didn’t figure out the mystery until the very end when the characters did. However it was a quick and easy read, I flew through it, and it wasn’t frightening or gruesome like a modern thriller. The only criticism I would have is that I found it hard to keep track of the characters sometimes, as I would in a real Austen novel. I would definitely recommend this to anyone who like old style murder mysteries and, obviously, Jane Austen. It’s a really enjoyable read and I can’t wait to read the next two.